The patented ACD (Anti-CANT Device) is a simple spirit level mounted in an aircraft-quality, two-piece aluminum scope rings that mounts in minuteswithout special tools. Properly mounted, the ACD allows the shooter to visualize and make adjustments for CANT, which experienced shooters recognize as rotation of a scope's crosshairs off a true vertical/horizontal plane. According to the Marine Corps Sniper Manual, compensating for CANT is critical to accurate long-distance shooting: At 1000 yards, 6 degrees of CANT (visualized as 1 minute on the face of a wristwatch) moves the bullet strike 55 inches from point of aim. Weekend shooters who find varmints a challenge at several hundred yards are no less immune to CANT: 6 degrees of CANT at 100 yards gives the critters a new lease on life by a full ½ inch. Installed on a properly mounted rifle or pistol scope, the ACD uniquely equips the shooter to visualize and eliminate CANT with 100% certainty, 100% of the time. The ACD has been extensively tested on rifles (does not require modification to the firearm or scope) and has stood up to heavy repeated recoil without shifting or detaching. Accuracy is within one-eighth of a degree. 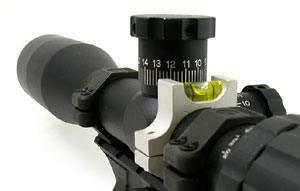 Mounts in minutes and can be placed either on top or below the scope, whichever is most comfortable for you and where it can be observed by the non-sighting eye.